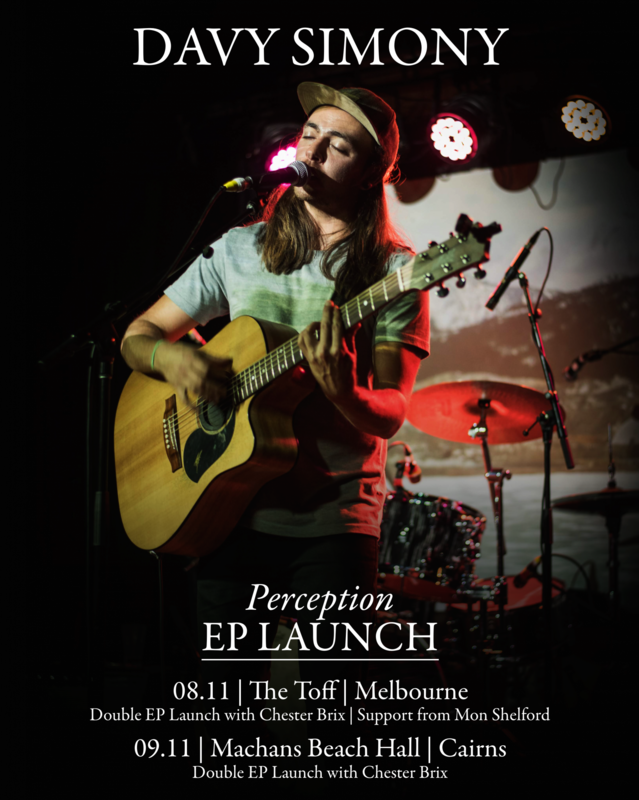 After the epic release of the single ‘Wipe off Your Shoes’ which got airplay on Triple J, Melbourne-based musician Davy Simony is pumped to release his third EP ‘Perception’ out to the world! The EP consists of 6 tracks of varying genres- mostly reggae vibes, there is also a soul track, a hip hop track and eventually the album closes with an emotional folk-ballad. ‘Perception’ is out worldwide via Spotify & iTunes on November 1. Davy will be holding a double EP launch at The Toff in Melbourne CBD on November 8. The co-headline act is indie-rock band ‘Chester Brix’ (which Davy happens to play bass in) who are launching their second EP appropriately titled ‘Pt. 2’. Supporting on the night is local soulstress Mon Shelford.If you’re in Melbourne, and you’re free on Thursday the 8th of Nov, you wont want to miss this epic night of music. Doors open at 7pm. Tickets are $7 online or $10 on the door.